Your worries will drift away when you wear the dreamy Sheepskin Suede Ankle Boot slippers from Minnetonka Moccasin. 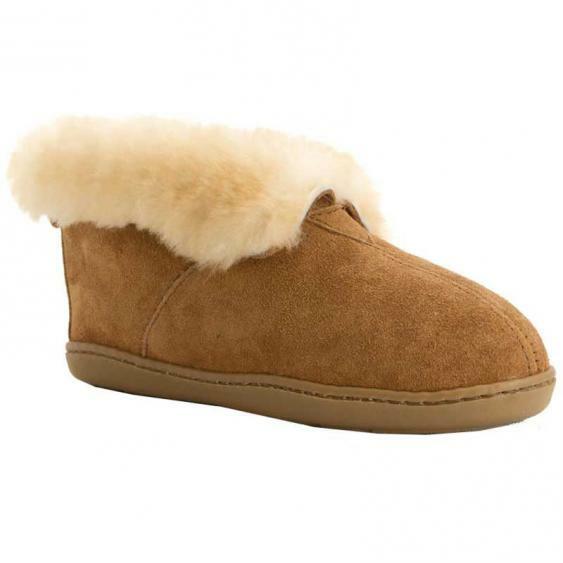 This men's slipper features a luxurious, genuine sheepskin fleece lining and a durable suede upper. The foldover sheepskin collar also helps keep out the cold. The fully padded insole is also lined in sheepskin for fully wrapped comfort, and the durable rubber outsole is perfect for indoor/outdoor wear. Native Americans wore moccasins long before Columbus discovered the land. It's fair to say that moccasins are truly America's first footwear. Completely casual, they define a relaxed and comfortable lifestyle. It's a simple idea....Classic design that never grows old combined with a natural, free-spirited heritage. Minnetonka Moccasin continues to define casual and comfortable American style.